The second W.A.T.C.H. Chairman’s Annual Fundraiser is being held on Thursday, April 12th from 8pm to 12am in the Loft at the Andrew Richard Designs studio (571A Adelaide Street East, Toronto) as they are being sponsored by the good folks at Andrew Richard Design Events (aka ARD Events). You can find ARD Events on Twitter at, predictably, @ARDevents as well as on Facebook again predictably at Facebook.com/ARDevents. The official hashtag for the event tomorrow is #WATCHCharity. I got invited to attend this night of music, art, and inspiration showcasing local talent from around the city and you can come too! Tickets are available for purchase online at http://www.watchcommunity.org/38 for $60 (also available at the door) which gets you admission, open bar, yummy treats, live music, local art and a silent auction (which will be taking place from 8pm – 10:30pm). I tried to find out some more details about what would be on auction in the silent auction but alas I was unable to get any details. So what is W.A.T.C.H.? W.A.T.C.H. is an acronym which stands for: Words. Actions. Thoughts. Character. Heart. They are a group established in 1997 as a community service organization for young people in Toronto’s most underprivileged neighborhoods. The original group was made up of students attending the University of Toronto who wanted to spend time with inner-city children in Regent Park. Since then, this core group has gone on to become successful professionals, including: lawyers, engineers, police officers, physicians, professors and corporate executives, among others. Volunteers interact with these young people in a one-to-one basis for activities like sports, music, the arts, and even some tutoring so the young people can create a brighter future for themselves. Since its founding in 1997 word has increasingly spread of the work being done by W.A.T.C.H. and their volunteers and so did the number of volunteers and supporters. Sounds like a great cause doesn’t it? You can find them on Twitter with the handle @WATCHfoundation or at their website www.watchcommunity.org. Buy tickets through the PayPal link on this page – http://www.watchcommunity.org/38. 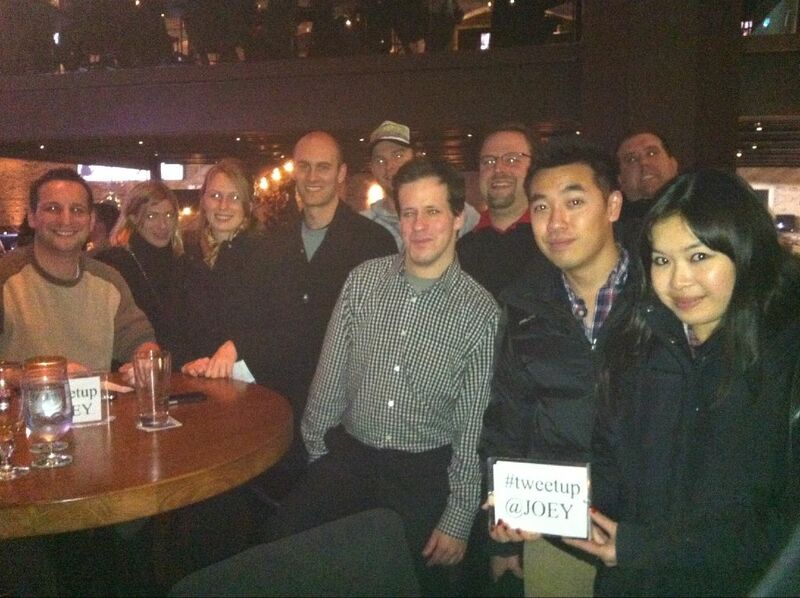 Remember, there’s an open bar and it is all for charity…what can be better than that? Tonight I will be heading out to an event by invitation from my friends over at Notable.ca. 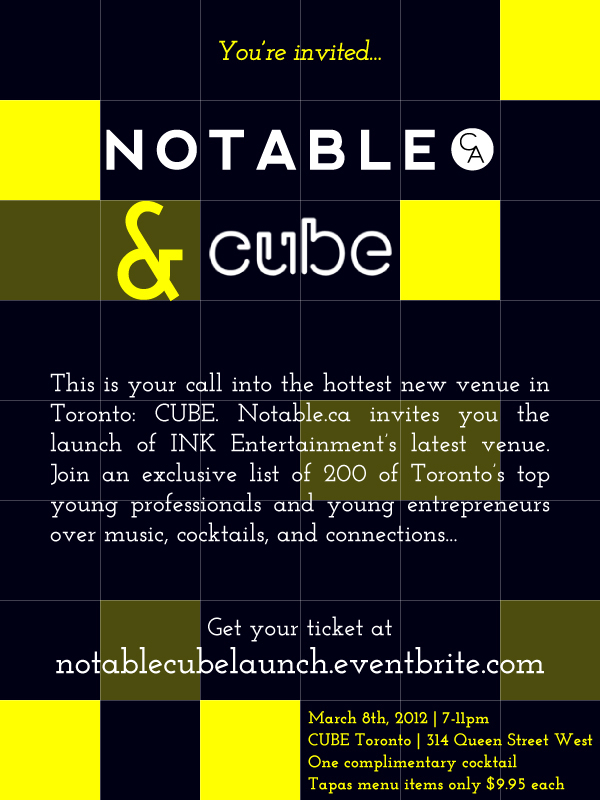 The event is, as the poster above implies, a launch party for a new venue in downtown Toronto called CUBE Nightclub (Web / Facebook / Twitter). CUBE is in the spot that was occupied by Ultra Supper Club for the past nine years at 314 Queen Street West, Toronto a couple hundred meters east of Spadina. CUBE is a complete overhaul of the space – which is still owned and operated by INK Entertainment – and is a complete departure from Ultra in that they are no longer going to be serving full meals and are instead going to have a shorter more “clubby” menu. 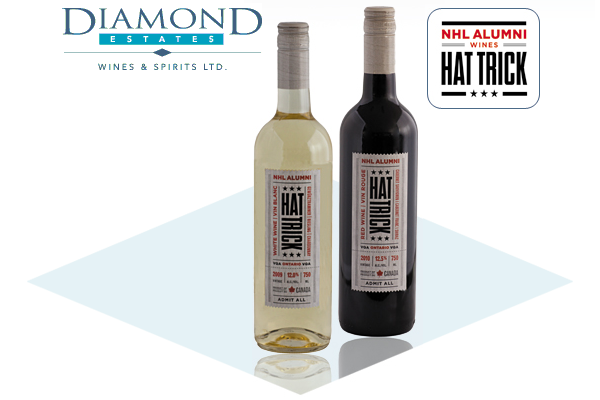 Tonight I have been invited by the fine folks over at Diamond Estates Wines (on Facebook and on Twitter @DiamondEstates) are launching a new kind of wine along with the NHL Alumni called Hat Trick. From what they have said in the press release they sent me they tell me that the wine is the result of Diamond Estates bringing together three distinctly Canadian elements for the launch of “Hat Trick’ Wine. Toronto, Hockey, and fine Niagara wines come together to create the perfect hat trick of distinctly Canadian elements to host the launch of Diamond Estates newest vintages “Hat Trick White’ and ‘Hat Trick Red’. Diamond Estates Wines & Spirits Ltd, one of Ontario’s leading winemaking facilities, has partnered with the NHL Alumni Association to come up with the new hockey-inspired VQA wines. Each three-varietal wine blend has been specifically crafted in collaboration between former NHL stars and the winemakers. $0.50 from each bottle sold goes to the NHL Alumni Association to support various charitable causes and promote the game of hockey. Charity is always good in my books which is why I am all the happier to be supporting this event and this wine. The event will be talked about on the Twitters using the hashtag #HatTrickWineLaunch. Also, something which sounds just awesome, NHL Alumni Members will be in attendance to comment on the development process of Hat Trick. Attending members include: Johnny Bower, Rod Gilbert, Mark Napier, Lou Franceschetti, Troy Crowder, Dennis Maruk, Ryan Vandenbussche, Jason Zent, Dave McLlwain and more! But, I have also decided that it isn’t enough to just tell you guys about an event I am going to because what the heck is the point of me telling y’all about an event you can’t or didn’t attend? This is why I contacted the folks over at Hat Trick Wines and they have graciously agreed to hook up one of my lucky readers with a prize pack! I can’t say what is in the prize pack because, I honestly don’t know right now but I have been told it’ll be damn good! So here’s the deal: All you got to do is comment on this blog post below about your favorite NHL experience. 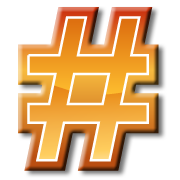 The tweet has to have my Twitter handle, Diamond Estates’, a link to this post & the hashtag to be a valid entry. Contest is open to GTA residents and is will be open for entry until Saturday afternoon at 5 P.M. Toronto time (as evidenced by my blog’s comment system – if it says you posted before then and you followed the rules you’re good to go!). Thank you to all who entered and I wish I could give you all prizes […except the Habs & Sens fans 😉 I kid, I kid!]. I hope to do more such contests in the future and hopefully I will be able to include a further reach than just the GTA. How I chose: I went through all the tweets that had been tweeted since the contest opened and wrote down the names of the tweeters going back from oldest to newest and assigned them a number starting with (duh) 1. I then went to the comments on this post that fulfilled the requested info – even if it was a Habs or Sens memory – and wrote down those names while continuing the count from the Twitter list. I again started with the oldest and went to the newest. 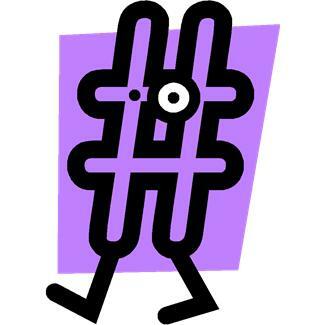 I then went to http://www.random.org/ and used their “True Random Number Generator.” The random number it spat out was matched to the above mentioned list and I had my name. The winner is…. @annecayer with this tweet. I will be contacting you shortly to get details so I can send it on to the people at Diamond Estates/Hat Trick Wine. 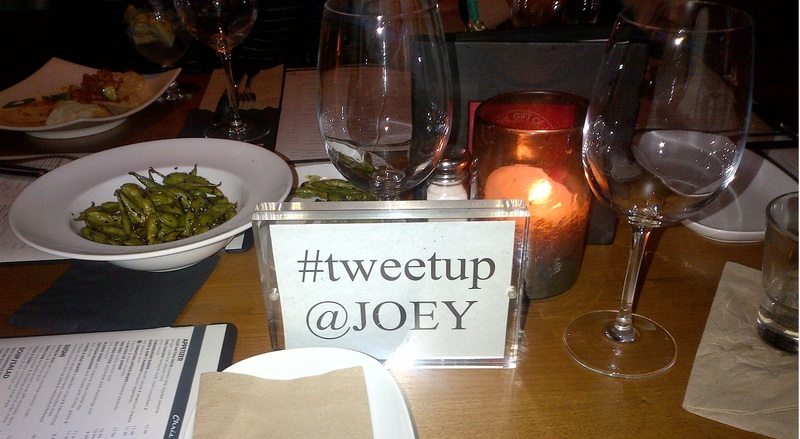 Joey Eaton Centre Toronto tweetup sign Szechuan Edamame in the background.